It was a beautiful sunny Saturday morning on May 6, 2000 in Buffalo, New York. The Reunion committee met at the D'Youville College reception hall on the city's West Side where their ancestors first settled in the 1870's. They were pleased with the wonderful newspaper article, which was published in the Buffalo News two days prior to the affair. It was a front-page article that covered the San Fele experience in Buffalo from the 1870's to the present. It also told of the Mass at Holy Angels Church and the reception to follow. This article awakened a flurry of activity among the San Fele descendants who wished to honor their ancestors. The committee had reservations for over 200 hundred persons which was capacity at the reception hall. Regrets were extended to the many who wished to attend. At noon the committee left the D'Youville campus and entered Holy Angels Church. To their astonishment, the church was filled with over 600 San Felese. A few came from as far as New Jersey and Pennsylvania. Most were from Western New York. The altar had posters with enlarged pictures of the San Fele landscape with strings of dried hot peppers attached to the poster. Father Anthony Rigoli, a non San Felese, gave a beautiful talk about the Italian spirit and culture and had the church guests laughing and crying with his humorous stories. An operatic solo of the Lord's Prayer enthralled those present. Immediately following Mass, the crowd crossed the street and entered the reception hall. The two hundred with reservations were soon joined by one hundred who would not be denied entry. Chaos turned into the most wonderful happening to occur in the San Fele experience in over fifty years. The happiness seen on everyone's face was so evident. Brothers, sisters, friends, cousins, god parents and neighbors who hadn't seen each other for years were all reunited on this special day. The oldest person present was 99 years old and the youngest 6 months. Proud descendents of proud ancestors! Reunion 2000 will be remembered as one of those special days in life that people thankfully experience. 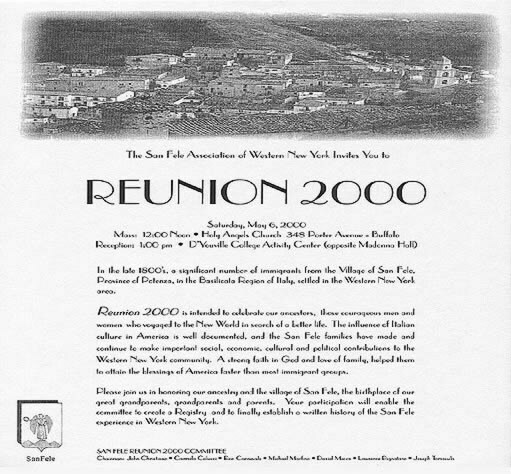 Another Reunion is being planned so that the hundreds of San Felese who were unable to attend Reunion 2000 will have the opportunity to join the festivities next year.